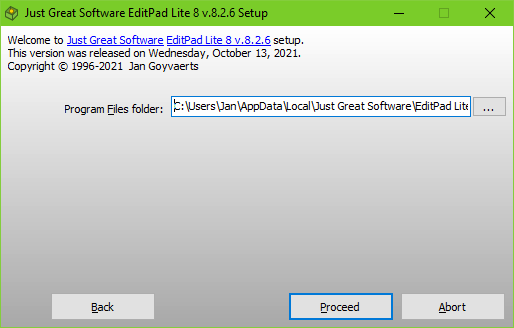 After clicking the "Advanced Installation" button on the welcome screen and choosing whether to install for the current user or for all users (if supported by the installer), the user can select into which folders the application should be installed. The ellipsis (...) buttons provide access to a tree view to quickly select the parent folder and type in the new subfolder to create. DeployMaster will not ask whether the selected folder should be created. Most people will want to install a new application into a new folder. The next step is to allow or disallow file associations.